*St Theobald of Ruggerio was born in Piedmont in Italy in 1170 and became famous for carrying sick people into towns from the countryside for medical treatment. 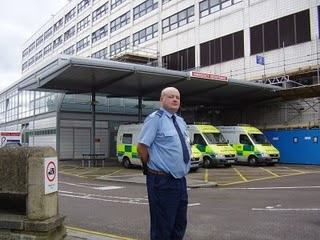 He is the Patron Saint of Hospital Porters and his feast day is June the 1st. Every year since 2008 the Porters at Oxford’s hospitals have met to celebrate St Theo and his legacy. Come to the John Radcliffe Sports and Social Club, beside Arthur Sanctuary House, Friday May the 27th 7pm till late (Football match earlier from about 5pm) Free entertainment: All the way from Nottingham, a bellydance show by Ustane. EXCLUSIVE: Live Internet TV broadcast. Civilians welcome. For more information contact Ben in A&E. IT broadcast? Geez, 21st century will came to SClub7 at last :-] U know exactly, how specific and old school this place is. As for photo, to inform visitors of this page, we're not allowed to have those model of shirts or ties anymore, due to h&s reasons (as infection control). Shame, cause IMO we looked smarter back then. You're right, Bro Po. Those old uniforms were very elegant, but the new ones are far more practical. I keep the old one for cermonial purposes. I'm actually not 100% sure if I'll be able to set up the webinar, but I'm going to have a good go using my daughter's laptop. If not then a HPANWO TV location recording will have to do. The rounders match will depend on Vince; he's going to try and sort that out. He's also going to try and get some of the old pre-Mediclean veterans in to join us. Plus, football and post-game wise, I think we can also count on a group of WW/JR2 theatre porters, as we have good links between our depts in cases of Shane and Robert McM, who's back with us :-) plus, I think it'll be fitting to have one toast dedicated to our "gone" colleagues, like "Chopper" and Phil Curtis... Looking forward to that day, then.